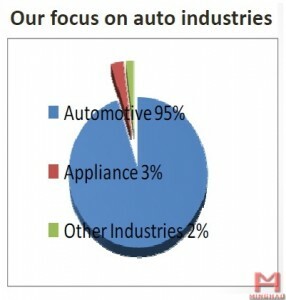 ﻿ Products - China Wuxi Minghao|China Wuxi Minghao Automotive Parts Co.,Ltd. Minghao main business is on exporting for large auto prog die, transfer die and fixture manufaxture , and stamping production. As a designer and manufacturer of advanced auto parts, we are engaged in development, manufacture and export high quality large progressive tooling, mechanical transfer tooling, including mould riveting, mould tapping and metal stamping parts, which help the global customers and partners to succeed. We specialized in auto tooling and fixture development, manufacture and exporting , especially large progressive tooling, mechanical transmission tooling, including the corresponding parts production: body stamping parts, chassis stamping parts and auto surface protective coating paint, galvanized parts, welding parts, assembly parts and so on. Our cars have comprehensive advantages in large progressive die, mechanical transfer tooling, and manual transfer die domain, from simple single die to complex 20 station consecutive stamping die, we can meet the needs of different customers. Through unceasingly exploration and the accumulation of experience in the stamping industry, we set up a exploration and stamping unique system, the pursuit of refinement, zero defect products as the goal, and execution of the internal continuous improvement, we are very willing to share the fruits of continuous improvement with customers and partners to make us different in numerous stamping industry. We have senior fixture team with high qualification and professional experience, the main research and development, design, manufacture and export of automobile sheet metal fixture, including single fixture and assembly fixture.